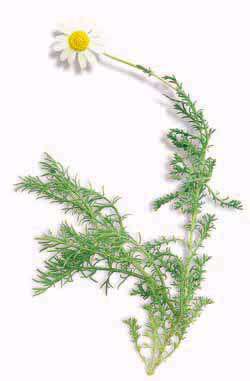 Chamomile is one of the most well known herbs, most popular for its calming effect; both on the body and mind. Its antispasmotic makes it effective for muscle and digestive pain. Its medicinal properties dont end there! Also beneficial for inflammation, infection and more. A steam inhalation infused with chamomile essential oil can help nourish the skin and mucus membranes while its antibacterial and anticatarrhal action can help clear infection and eliminate mucus buildup. When added to a hot bath, chamomile aids in muscle pain relief. Flowering tops can be used to make a relaxing tea. Roman chamomile is characterized by its creeping growth pattern, and sweet woody smell; a traditional English groundcover herb; useful for filling spaces between flagstones, cracks, and paths. Avoid matted growth by trimming down or mowing. Unlike other chamomile varieties, Roman chamomile is slow growing and not self seeding. Plants can be split and relocated every 2-3 years. Prefers adequate moisture without overwatering. Locate in sun to part shade. Ht 3-4in; spread 2-4in.